Core i7 brings with it triple-channel memory, and while 4GB is better than 2 gigs, 6GB is, of course, even better. So long as you can afford it. The kit runs at 1,600MHz, so there are no problems with running at full speed. Not content with standard heatspreaders, the Dominator modules have the excellent DHX heat exchange, allowing for some impressive cooling should you feel the need to ramp up the clocks. 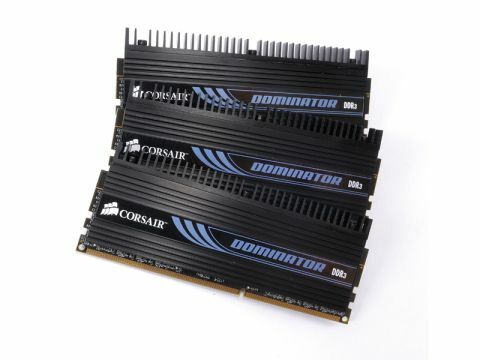 Thanks to the high clock speed and extra channel, Corsair has blown all the other modules out of the water, with a staggering 27,161Mb/s throughput, and an impressive 16,156Mb/s read speed. If money's no object then the Dominator kit is without doubt the ﬁnest triple-channel offering.